The rent at KaktusLife Apartments ranges from $1,585 for a one bedroom to a $2,370 two bedroom. Apartments in this building are about 39% more expensive than the Enterprise average. This is a pet-friendly apartment. KaktusLife Apartments has a Walk Score of 2 out of 100. This location is a Car-Dependent neighborhood so almost all errands require a car. KAKTUSlife is the premiere luxury lifestyle residential apartment community in Las Vegas, Nevada and the first of its kind in the valley. KAKTUSlife is attractive to a sagacious clientele who value technology, health and sustainability in a connected co-living environment. KAKTUSlife offers the best of Las Vegas all in one convenient, modern, luxurious, and central location. This premier, upscale residence is located steps from the Las Vegas Strip and Town Square. Enjoy the perfect blend of convenience and home with nearby restaurants and shopping. We’re a community within a community. We have created an engaging culture and unique, sustainable living accommodations at an unbeatable location. Live, work, relax, indulge, and play- it’s all right here. 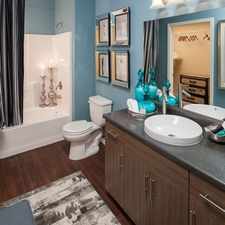 We want you to share our sense of home by offering various layouts that fit your style preference. We offer customizable features for each unit type with luxe finishes and rich details to be fully immersed in our KAKTUSlife. Explore how far you can travel by car, bus, bike and foot from KaktusLife Apartments. KaktusLife Apartments is in the city of Enterprise, NV. Enterprise has an average Walk Score of 24 and has 108,481 residents.